M’Chel Bauxal is known as one of the top makeup artists in Oregon and beyond. She has done the makeup of celebrities and is also known for her flawless bridal makeup too. She will make you feel completely at ease as she listens to the details of your event and of your personal style. 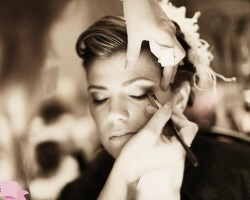 She will take this information to create the best wedding hair and makeup look to suit the occasion. As you will see in the reviews you are guaranteed to love the results. Olivia Hawthorne has been studying and offering makeup services since she began her career in 2003. Since then, she has developed this company, kept up with the latest industry trends and has also hired other professional Portland makeup artists to better serve clients like you. You can choose one of the bridal packages to make sure that you are getting all of the services that you will need to feel confident and ready to walk down the aisle. You can even contact this team to make special requests or ask more questions about their work. Alison Mora is the owner and operator of Makeup Beauty and Beyond. She has been a freelance makeup artist in Portland, OR since 2004. Knowing how stressful getting ready for your wedding day can be, Alison offers a trial run of your bridal look before you make a decision on the style you would like and the exact shades of makeup you prefer. This is the best way to be sure that the process on the day of the wedding will be seamless and easy. When you want to work with a professional that really is talented in her craft then you need to hire Kassandra Sommerville. This expert knows how to make women look and feel their best, especially for a special occasion like your wedding. Not only will Kassandra offer you a flawless look that keeps with your personal style and enhancing your natural beauty, but understanding the nature of the occasion, she will also make it feel like permanent makeup that will last. For the last 12 years, Kellye, of Kellye J Hair and Makeup, has been offering comprehensive on-site beauty services that are customized to the client and the event. This expert can complete the makeup of the bridal or the entire bridal party so everyone can join in the beauty fun. She will make everyone feel beautiful and comfortable as you get ready for the special day and at affordable prices, it is well worth eliminating the stress that would come with getting yourself ready.